Moving is one of the most stressful things that we do. Even when you prepare properly for a move, the emotional and physical stress can be a lot for people to handle. Families with children or elderly relatives may face even more difficulties. What some people forget about is that moving can be very hard on your beloved pets too. From an older cat to a young puppy, moving with pets can take a major toll on your “fur kids” since they’re less equipped to understand what’s happening than their human counterparts. Making a move easier on your pets is possible, though. Keep reading to learn more about how you can make moving day and the first few weeks in your new home less stressful for your pets. Physically moving your cat or dog safely requires a crate with a locking door that they can comfortably fit inside. Even if you have a large breed dog, crates are essential for safe transportation of your pets. The problem is that many pets simply aren’t used to their crate. To make moving with pets easier, get a proper crate a few weeks before you’re packing up. That way you can teach your pet to get used to their crate and not fear the time they spend there. One of the best ways to do this is to take short trips with your pet in the car. Then on moving day they won’t be so nervous about your road trip. You can also put pets in their crate at home for short periods of time and feed them there on occasion. Doing this can make the crate feel like a comfortable space of their own, not a place where they go when something scary is about to happen. Your pets are likely to get anxious on moving day when boxes and belongings are all over your home and making their way out the front door. 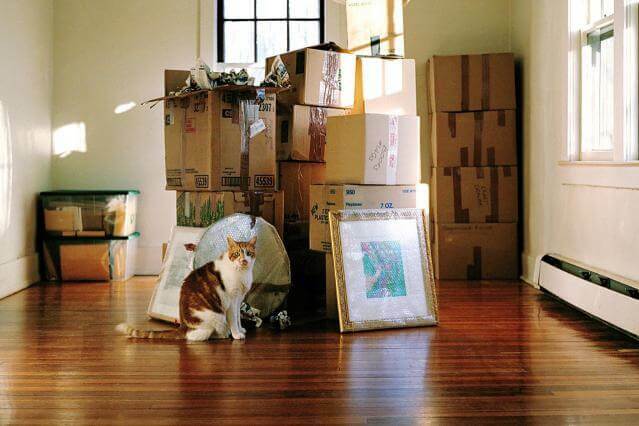 To keep their stress levels low, giving your pets a protected space during the move can be very helpful. To do this, you may want to clear out space in a place where your pet tends to spend time like the master bedroom as early as possible. Doing this can shield them from the commotion on moving day and make sure they’re safe. Make sure you provide all of their favorite toys, a soft place to sleep and plenty of water on moving day as well. Once the house is clear, you can pack up your pet in their crate and move them to their new home. Moving pets is about more than keeping them safe on the big day. You also need to think about their well-being and comfort as soon as they arrive at their new home. That’s why setting up a space for them early before they even arrive, can be helpful. Ideally, the space for your pet should be one that can be their own, though they may want to spend time with you as well. While essentials are different for cats and dogs, you’ll want to have things like favorite toys, beds, blankets and anything else they’re used to available. Litter boxes for cats will also need to be in a protected space. Over time, you’ll likely find that your pet wants to branch out and explore their new space. At first, though, they may need their own area to retreat to when a new environment is just a little bit too overwhelming. Follow these tips on moving with pets and your furry family members will hardly notice the commotion on moving day.